– Full flexibility of all media trays – DICOM – Excellent price/performance ratio. High-quality images everywhere and anywhere DRYSTAR 5302 offers high-quality printing in a convenient table-top size, so you can offer next-to application printing in even the smallest spaces. This freedom of placement, combined with the low investment and running costs, makes DRYSTAR 5302 the perfect match for many modalities, and the right answer for your printing needs. 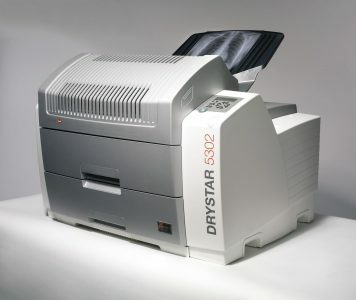 DRYSTAR 5302 offers high-quality printing in a convenient table-top size, so you can offer next-to application printing in even the smallest spaces. This freedom of placement, combined with the low investment and running costs, makes DRYSTAR 5302 the perfect match for many modalities, and the right answer for your printing needs. A single-step process, a simple mechanism Compactness Reliability Accessibility Daylight-insensitive film . Thermo Sublimation DRYSTAR TS 2 films use Thermo-Sublimation, a dry imaging technique that can be used in full daylight. Designed to provide brilliant, full-spectrum color imaging with a minimum of effort, Thermo-Sublimation is a dual-component system that uses heat to transfer colored dyes from a donor sheet to an acceptor sheet. This state-of-the-art dry color imaging solution produces higher Dmax and contrast than any other thermal dye diffusion printing systems currently available on the market.